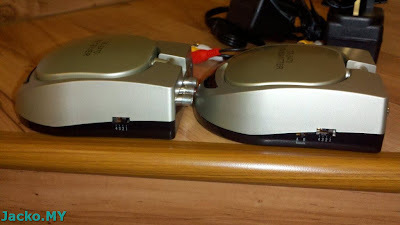 The Remote Out (the transmitter on the left) enables total control over the decoder remotely from the second TV. In other words, you can change channels (using the same Astro remote controller) remotely from the second TV just like sitting in front of the first TV. 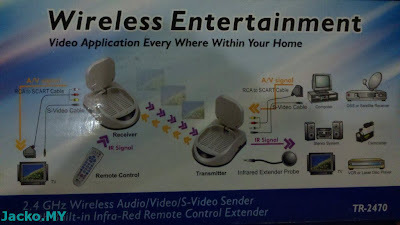 Since it rides on 2.4GHz frequency band (similar to most wireless router, cordless phone etc) the extender usually packs with a channel switching feature so that you can switch to a clean channel if there's interference. 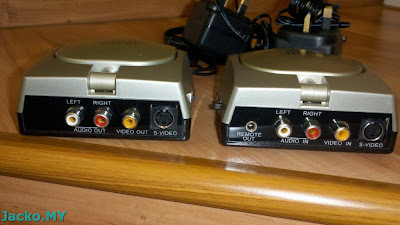 This unit features a 4 channels switching option as shown above. 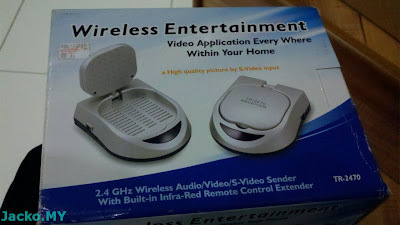 Perhaps it's better to fork out a bit more to get a 5GHz extender if your house (and your neighbor) is full with wireless devices (note that new wireless N routers operate on both 2.4GHz and 5GHz). Google wifi scanner and use the free tool to check the house surrounding if you want to be certain. Connect the transmitter using RCA composite cable to the decoder by matching the colors. 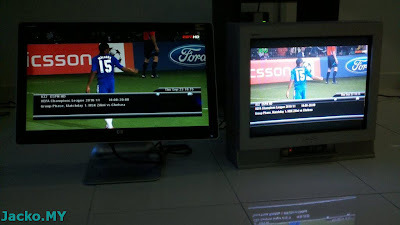 Repeat the same on the receiver with the second TV. 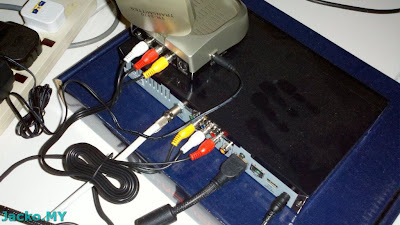 Now come to the meat for new and to-be Astro b.yond subscribers, the most frequently asked question - can the new decoder output both digital (via HDMI out) and analog (via the composite out) simultaneously? Yes. On the left is my HP monitor connected to byond decoder's HDMI out and on the right is obviously the old TV via the composite out. Stick the IR extender to the left of smart card slot. You will see black bars if the aspect ratio of both TV is mismatched. EG: 16:9 vs 4:3 as shown above. 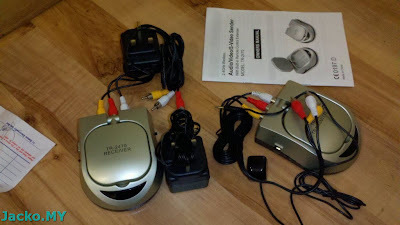 Dolby Digital is not supported over composite out. 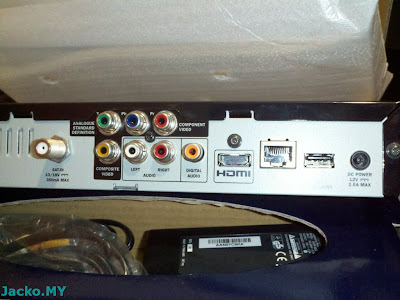 You will not get audio on the second TV (connected via composite) when watching HD channels. You have to change it to stereo in the Setting. No HD quality on composite out. It's still a 2.4GHz extender and I couldn't find one operates in 5GHz in Klang Valley, anyway this second model works well for me though. 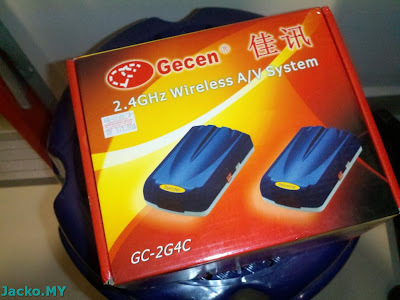 The price was RM290 and I learned that it's ranging RM200-300 for such extender. 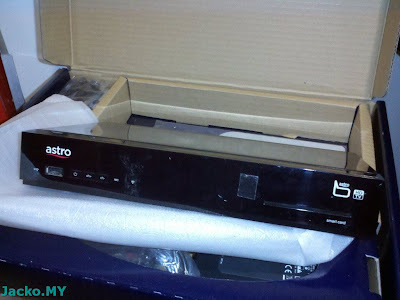 You might get charged RM350 or more if you ask the Astro contractor to setup for you. I only complete part of the project. 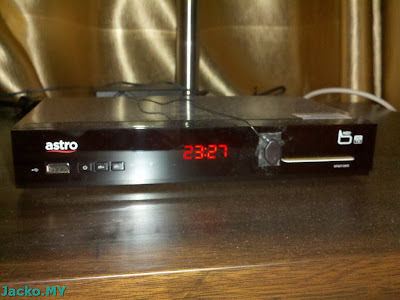 Coming up next is how do I maximize my ROI (of Astro subscription) to output the HD channels to a second HDTV? p/s: if you're looking for a second Astro b.yond remote controller, you can get it from Pineapple Computer Store in 1U. Exactly like original, RM40 for one. dude, depend where you are. if in klang valley, you can go to Jalan Pasar near Pudu area to source one. Or go to any of the electronic shops (those shops selling wires, LEDs, power switch etc) at your area.